Hi there! Today’s post is about a mani I did quite some time ago. 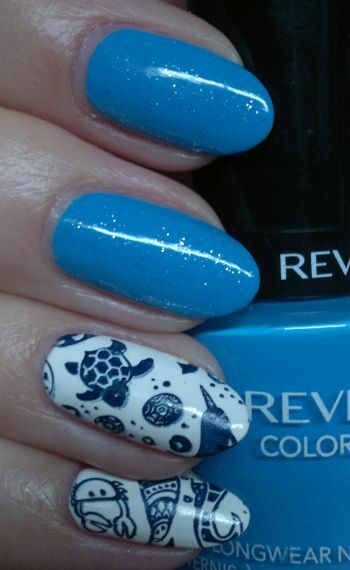 For this mani I painted my nails with Primark PS… Nail Polish Snow White (2 coats, pinkies, ring fingers) and Revlon Colorstay 170 Coastal Surf (2 coats, middle and index fingers, thumbs). I wanted the blue nails to sparkle, so I applied 1 coat of Sally Hansen Xtreme Wear 620 Glam Fest. I used MoYou London‘s Doodles 07 stamping plate and Sally Hansen Complete Salon Manicure 834 Dark Knight for the images. « Major Haul! Yves Saint Laurent, Thierry Mugler, The Crème Shop, Patisserie De Bain, Soap & Glory, Sanctuary Spa, Boots No.7, Valjean Labs & More! Oh my gosh this stamping plate is adorable! I love turtles. And is that a narwhal?!! Yes, it’s a narwhal. This is one of my favourite stamping plates.